I’m not really much of an art buff. I took art in school, but I preferred making things to painting. I’ve never really enjoyed going to art galleries or museums. I find most art to be pretty boring. Then I found Pascal Lecocq. The first time I saw his art was at the Dive Show in Houston 2 years ago. Full of breathtaking blues, with surreal scenes of Scuba Divers in various states of non-diving activities. It was breathtaking. It was mesmerizing. It was unforgettable. Pascal was easy to find at the Texas Dive Show in Dallas. 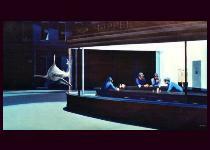 A sea of blue, with people standing around, silent, gazing at his paintings. I had finally found art that I admired, that I could just stand in quiet wonder, imagining the scene if it were to come to life. It wasn’t that I didn’t like art after all, I had just never found any that I liked before. I can imagine filling my house with his art. 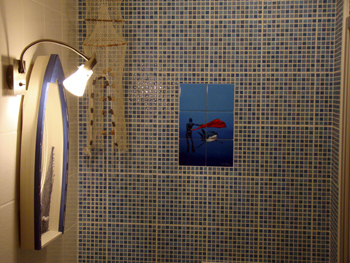 Pascal even has art on tiles, and I’m imagining when we finally get around to re-doing our bathroom, having several of his pieces right there in my shower, like this lucky person in Switzerland. 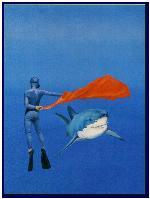 Pascal’s signature painting in a Diver with a flag, acting like a bullfighter with a shark. 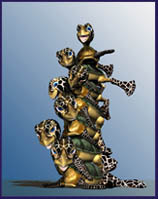 There are many more that I like, such as the turtles piled on each other, and takes on popular culture, like the divers in the Hollywood Blvd scene. My personal absolute favourite though, is the long thin painting of a free diver as she heads back to the surface. It evokes a silent calm to a room.